About four months after the death of my stepfather, Dennis Hawes, three of us sat down with a small bundle of papers that he had saved. My mother opened the folder up and we spent an entire evening sorting through them, deciphering ancient handwriting and trying to work out what each document was about. Some were obvious. My stepfather's birth certificate. His parents' wedding certificate. 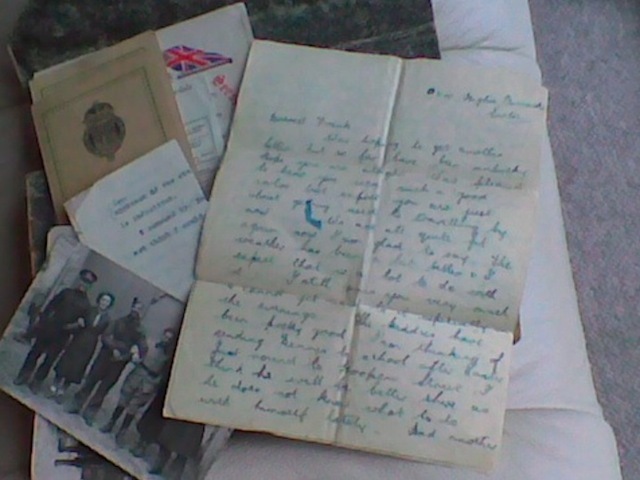 Letters between various members of the family - between Dennis' parents, from Dennis to his siblings, more letters in return. And finally, a diary, with entries written in every single day from January 1st to December 31st 1942. It had belonged to Den's brother Eric, and was an incredible thing to hold and to read. Eric wrote of his feelings about Ella, the woman he planned to marry. He wrote of his fondness for communism (a fondness shared by Dennis - and by a lot of liberal-minded young men at the time) and his hope that, when the war was over, the British monarchy would give way to a communist government operating for the good of all. Idealistic, yes, but this was before the war was won. Before the Holocaust was discovered, before communism in the Soviet Union was ruined by dictators and despots. What struck me most of all while reading through all this was that it had survived at all. Some of these documents had been passed from Dennis' parents to Eric, then to his sister Ivy on Eric's death, then to Dennis when Ivy died a few years ago. And finally to my mother, unrelated by blood to any of them but as Dennis' widow, the last member of the family. Last except me, of course - and through my family, the memory of the Hawes family can live on. Thanks to those papers. I looked at the bundle of documents and wondered: if I were to die now, would as much as this survive of my life? The answer is certainly not. Nearly everything important to me, nearly everything I have created during my adult life, is digital and stored on a hard disk or a server somewhere. Very little of interest would survive me if I died. That thought bothers me a great deal. I've never claimed to have much talent as a writer but I'd like to think that when he's old enough, my son will be able to read through my articles and enjoy them (or criticise them, as he sees fit). As things stand right now, he won't even get that opportunity, because everything I've written has been emailed into non-existence. Google knows where some of it is, but who's to say that Google will still be serving up quality search results in 10 years from now, when my son is a teenager, or in 20 or 30 years after that? My stepfather's papers have lasted, in some cases, almost 80 years. There's no reason why they shouldn't last as long again, given the right storage conditions. My choices - and, I'd argue, those of anyone else in a similar position to me - are quite simple; either make arrangements for all my digital output to be hosted and stored at unchanging URLs for the long-term future; or, print out as much of it as possible, and keep those print outs safe. The first option is perhaps possible, but would be hugely expensive, and wouldn't even offer me much peace of mind. If I paid five thousand pounds to a hosting company for "lifetime+1" hosting, there's no guarantee that such a company would survive that long. Businesses thrive, then they die or get transferred to new owners. There's nothing to prevent even the largest of companies from changing hands. And who knows what the new owners would do with them? I think I should start printing things out, and sticking them in a simple folder. Nothing fancy, no need for ceremony or fussy presentation. Just the words, on paper, so that when my boy (or his children) have the time and inclination to discover what Dad (or Grandad) did during his mis-spent youth, they will have something in their hands that they can hold, pass between them, and enjoy. Just as I've enjoyed the papers that Dennis left for us.